Teshia's latest Special "Griz-edition" piece is a large & striking 36"x48" Acrylic on Canvas Painting. 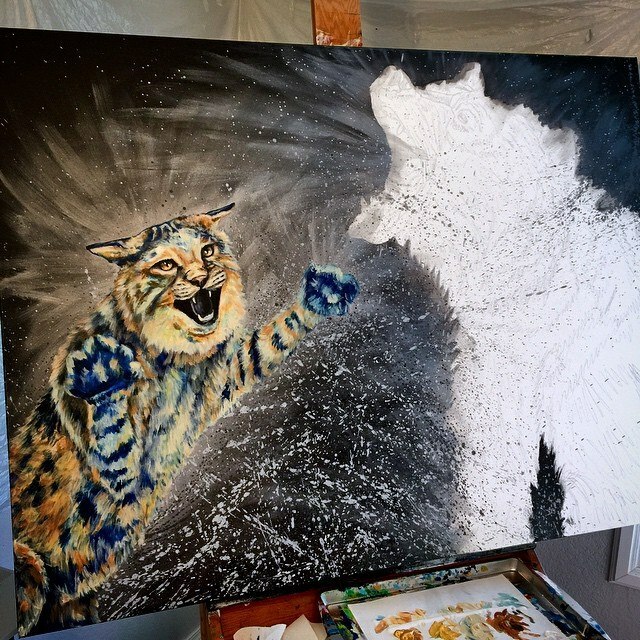 This one-of-a-kind Original Painting features a fierce Grizzly Bear, dueling a fighting Bobcat, in an action-packed scene that we have all come to know as the "Brawl of the Wild"! This energetic art piece is reminiscent of Teshia's immensely popular 36"x48" Original Painting,"Dominance", which was auctioned off & sold at the 2013 GSA Wine & Beer Festival. Though with this piece, Teshia's desire was to recreate the powerful dynamism of "Dominance" in a special piece that portrayed BOTH of Montana's legendary mascots together in a suspenseful & enthralling battle. As with all of Teshia's works, this piece radiates liveliness, while still maintaining the bold & beautiful style that Teshia's paintings are known for. This piece is embellished with lustrous metallic accents & is finished with numerous coats of UV Protectant gloss. Teshia hopes that this new & exciting piece will bring year-round Griz/Cat action to it's new home....and maybe even a bit of luck. Let the brawl begin! Go Griz! The Original The Brawl Painting was donated by Teshia to the GSA Brawl of the Wild Auction in Nov 2014 in Missoula, MT. The Original Painting was SOLD there to a Private Collector. Proceeds from the Original The Brawl painting benefitted the University of Montana Grizzly Scholarship Association.